MBOX to Thunderbird Importer will liberate you from the tedious and time taking process of moving the MBOX file into Thunderbird. You can import the .mbox file of other email clients like: Gmail. 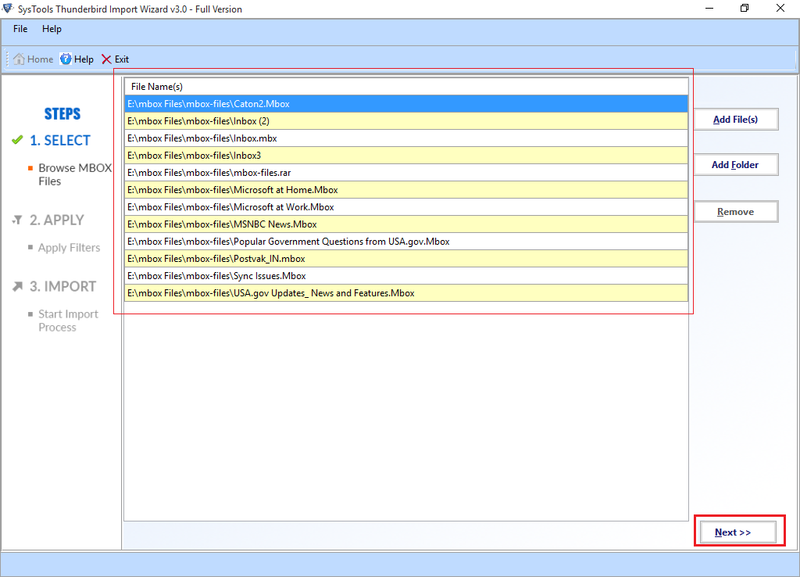 Add Files: This particular option allows you to add multiple .mbox files one by one. 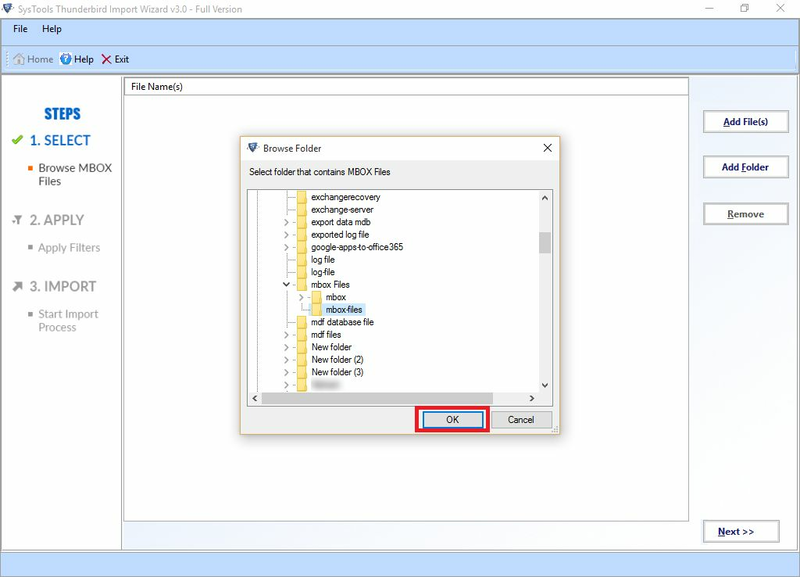 Add folders: This option provides you the facility to add multiple MBOX files in bulk at a time. Meta properties, as a vital part of emails are effectively preserved with the use of MBOX to Thunderbird Importer. After performing the transfer of MBOX file in Thunderbird, all the meta properties are retained without any alteration. The utility proffers you the facility of keeping the folder structure intact. After importing the email file into Mozilla Thunderbird the nested folders of MBOX files also remain preserved. 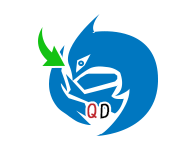 This application also support the SBD folder containing MBOX files. 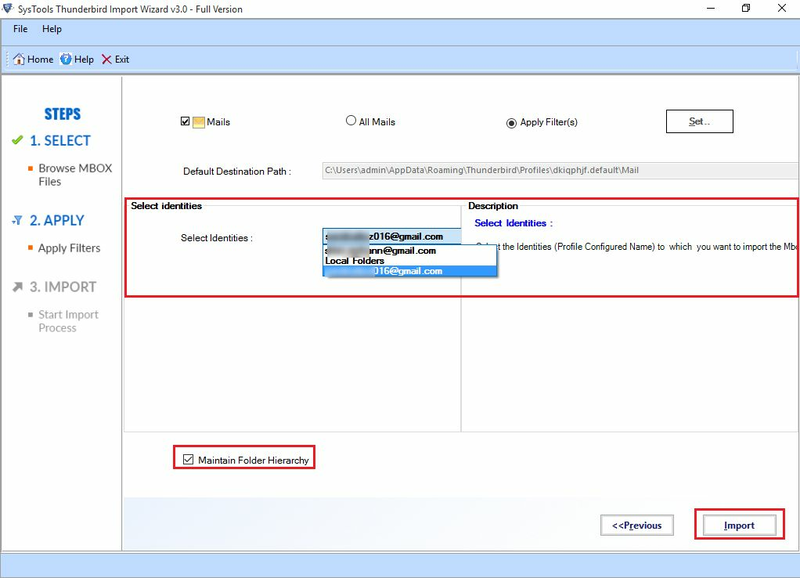 If you do not want to import all the emails into Thunderbird then MBOX to Thunderbird Importer offers you opportunity to apply date filters and import the emails of required time interval. Therefore, You need not to go with entire emails transfer. The software is compatible with the MBOX files of distinct email clients. You can import Gmail MBOX to Thunderbird. Along with that, supports .mbox file of other email clients. With the transfer of different .mbox files, MBOX to Thunderbird Importer also keep the attachments and inline images unaltered. After getting the MBOX file imported into Thunderbird, there will not be any loss of any attachment or inline image. 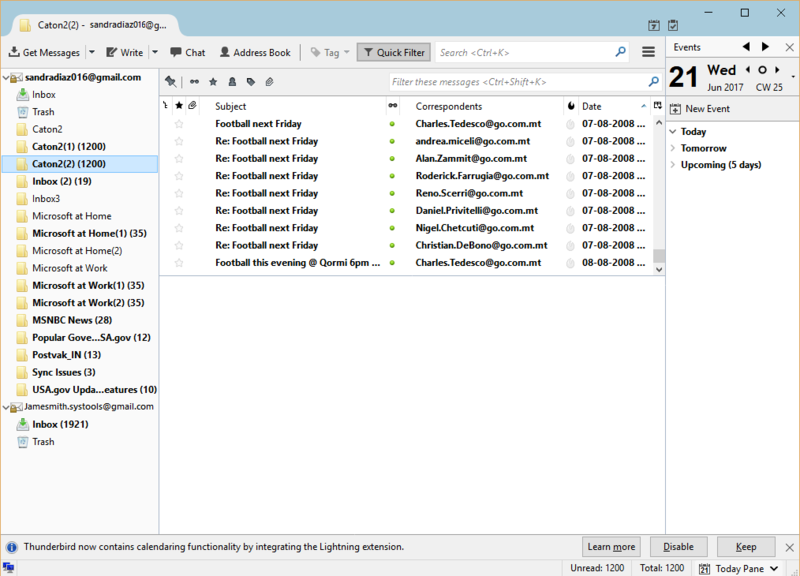 Thunderbird is a desktop based personal information manager used to manage the multiple mailboxes at a time. It is available open source. All the emails of mailboxes present in Thunderbird are locally stored in MBOX file format. The default location of MBOX file on your system is: C:\Documents and Settings\(Windows user name)\Application Data\Thunderbird\Profiles\. You will find MBOX file (without any extension) at this location on your system. 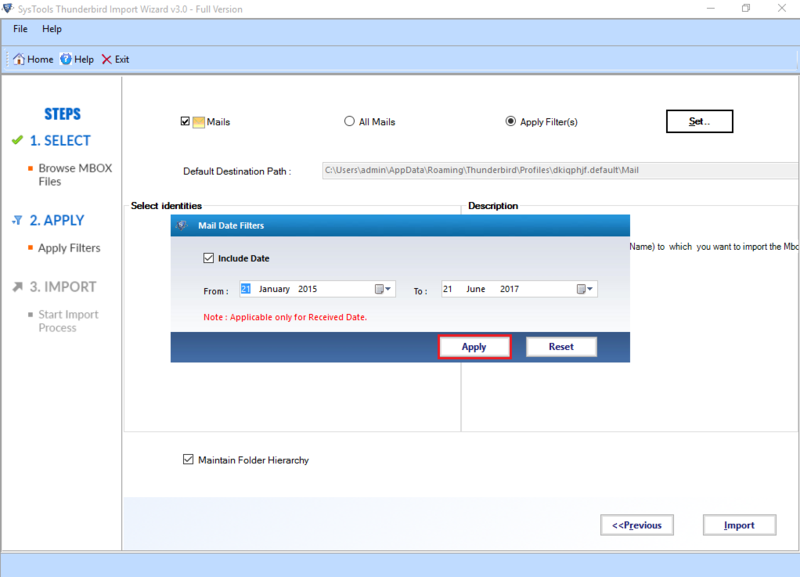 Free MBOX to Thunderbird Importer tool only import first 25 emails. Step 1: Install the software after downloading. Launch the tool from Start >> All program >> MBOX to Thunderbird Importer. Step 2: You will get two options to add files. Add Folder: To add folder containing mutiple files. In case of multiple files in a folder. Click "Add Folder". Hit "OK" button. Step 3: Then, You will be able to view all the files present in selected folder. Step 4: Now, You can apply filters, Click "Set" button. Step 5: Now, you can set date for required data of particular time interval. Step 6: Then, You can see all the email accounts that are configured with Thunderbird. Click on "Import" button. Step 7: You will get notification after completion of process. 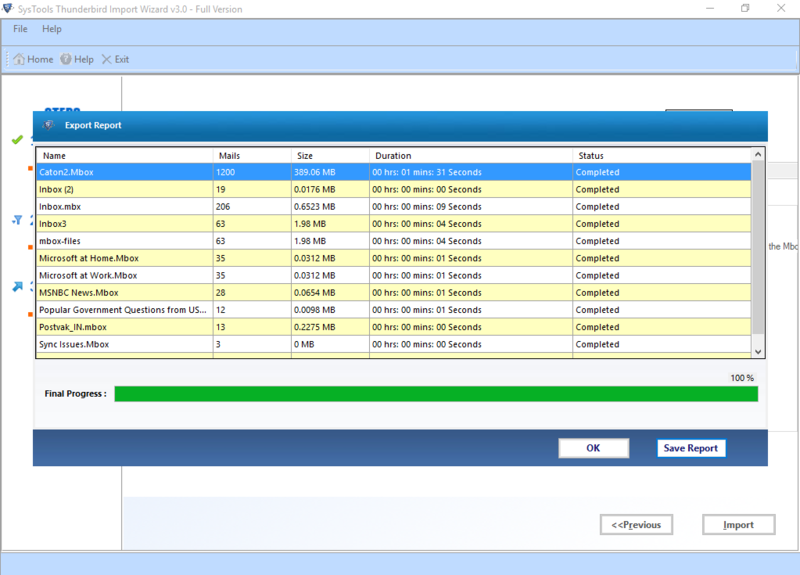 Step 8: You can save the generated report, Hit the "Save Report" button. Step 9: At last you can transfer the output file into Thunderbird. Is the Software runnable on MAC OS? 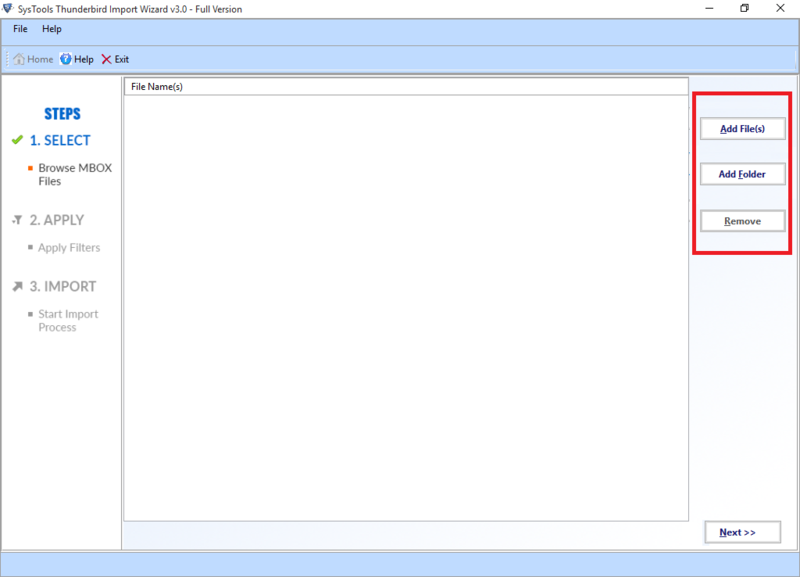 How many MBOX files can be imported in Thunderbird? You can import multiple MBOX files at a time. How to manage the folder hierarchy during import process? 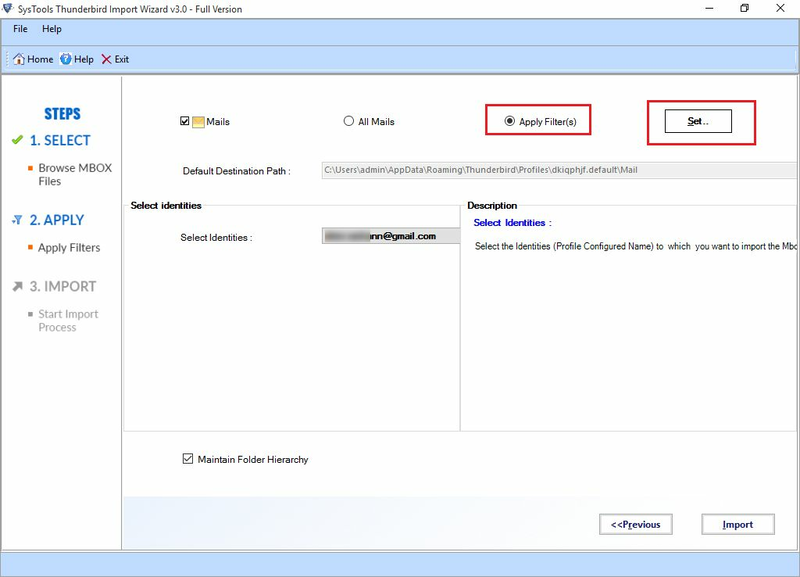 Managing the folder hierarchy is just one click away. You need to enable the provided option. I had multiple mailboxes of my previous company's employees in MBOX format. 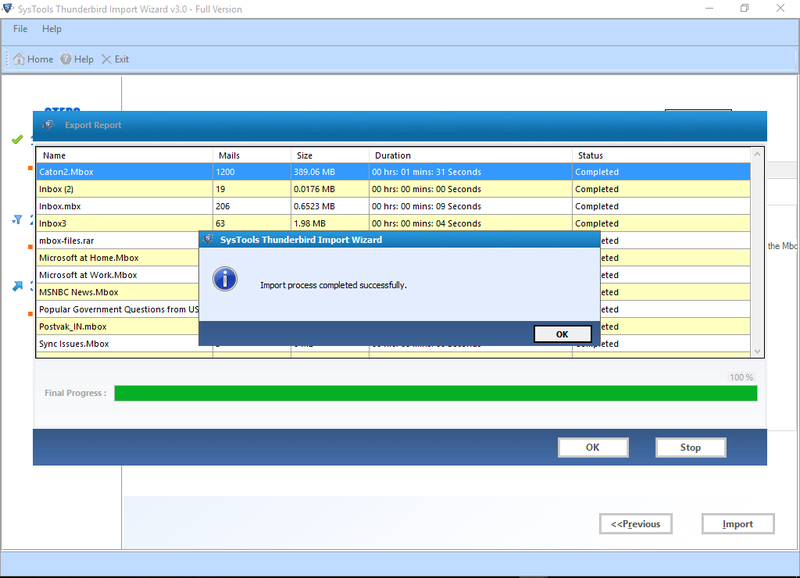 QuickData Thunderbird Importer finished my task in no time without any data loss. Since, I am not much technical person, found very easy user interface. The assistance of the Support team is really a part of appreciation. They helped me alot at each and every step of the entire process. Thanks, for such a great support.